Colon Cleanse Special Giveaway - 20 Winners! We have overstocked bottles of Ionic Colon Cleanse that will be expiring on 7-31-19 and we are giving away a bottle to 20 winners. This is the perfect chance to try our amazing Colon Cleanse at a super reduced price. Enter for your chance to win today! 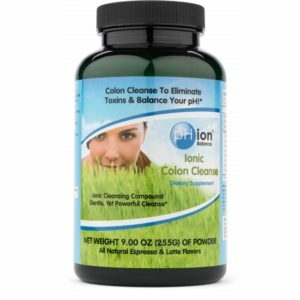 pHion's Ionic Colon Cleanse contains Bentonite Clay which is superior to other cleanse ingredients because it removes bodily waste as it detoxifies the regions of the body. It attracts heavy metals and toxins and gently and safely flushes them out of your system. Just simply add a spoonful of Colon Cleanse to any favorite juice or shake. Giveaway is open to those with a US address and will run thru April 24th, 2019. Winners will be notified by email within 48 hours of drawing and a bottle of pHion Ionic Colon Cleanse will be shipped to the address provided. Winner must reply within 48 hours of notification or prize will be forfeited and a new winner chosen. Get a bottle of the expiring Colon Cleanse now at 70% OFF! Just enter the code CLEANSE70 at checkout. Can't wait to try out the colon cleanse. Thanks for the wonderful chance to try your cleanse product. I'd like to have Alkaline Tea Blend and Alkaline Minerals.